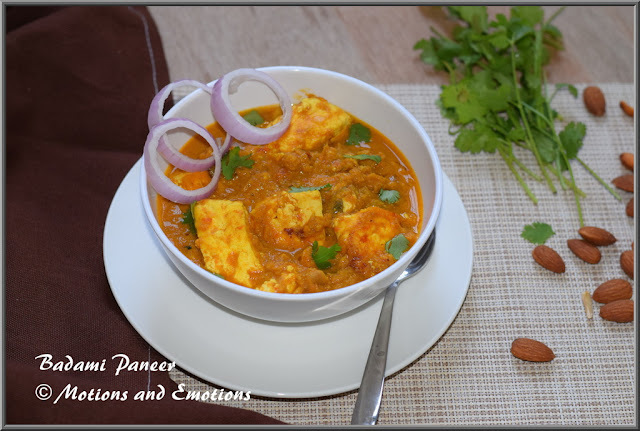 Badami paneer is a delicious paneer dish where juicy paneer cubes are cooked in a rich nutty flavour of almond paste. The gravy gets a rich yet creamy and sweet texture of almonds. Onion also contributes sweetness to the gravy. Along with the other spices (read Indian spices) this gravy gives a royal taste. Almond is a popular nuts which has lot of health benefits. You can eat almonds just like that as a snack. It is a good source of vitamins and minerals and helps to lower the bad cholesterol level and increase good cholesterol level. Today almond is widely used in vegan dishes. Normally I eat almond as a snack. Obviously I prefer to eat the unsalted ones. Even I add few to my daughter's snack plate. I remember my mother used to give us (two sisters) soaked almond in the morning. Apart from that I do add almonds sometimes to my overnight oats or sweet dishes or cakes. Beyond that I have never explored almond in cooking. This is the first time (I think so I haven't used it yet) I have used almond in a gravy and it turned out so good that I am planning to use more almonds in my dishes. Do you add almonds in cooking? If yes, do share the way you include almonds in your dishes? 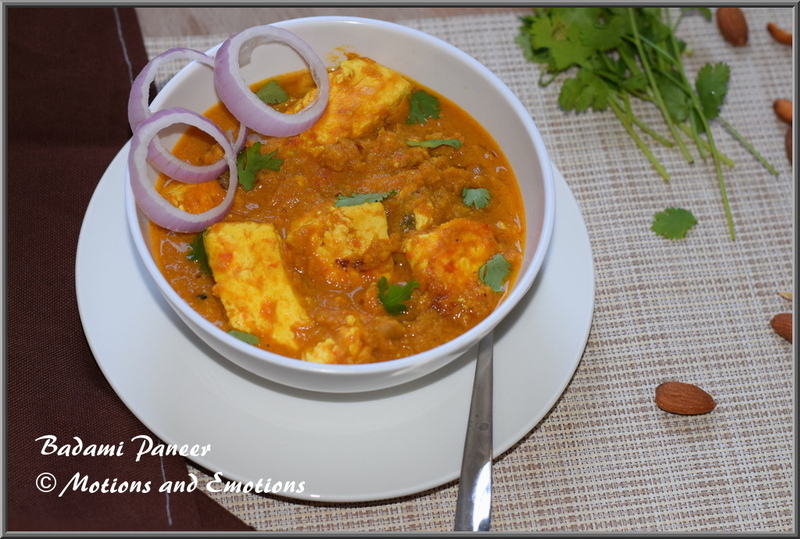 The Badami paneer can be well paired with any type of Indian bread (whole wheat lachha paratha, Stove-top butter naan, Maida Paratha, etc.). I think it will also go well with Jeera Rice. 1. Soak the almonds in hot water for 10 to 15 minutes. 2. After soaking the almonds, remove the skin and keep them aside. 3. Cut the paneer into long cubes. 4. Heat 2 table spoon oil and sauté the paneer cubes with little turmeric and salt and keep them aside. 5.Take almonds and tomatoes in a blender and make a smooth paste. 6.Heat the remaining oil and add chopped onion and garlic. Sauté till they are translucent. 7. After that add ginger paste and cook well. 8. Next add turmeric powder, cumin powder, coriander powder, garam masala powder and red chilli powder. Mix them well. 9. Now after cooking the masalas switch off the gas and allow to cool the masala for sometime. 10.Next take the masala mixture in a blender and make a paste. 11. Now heat ghee in the same pan and add cinnamon stick, cardamom, clove and bay leaf. 12. Next add almond and tomato mixture and cook until the raw smell of tomato is gone. 13. Add salt and sugar and mix well. 14. After that add the masala paste and mix well. 15. Add 1 or 11/2 cup of water and allow to boil for some time. 16. Next add green chilli and sautéed paneer into the gravy and cook for 5 more minutes. I have never tried badami gravy yet. This looks delicious.